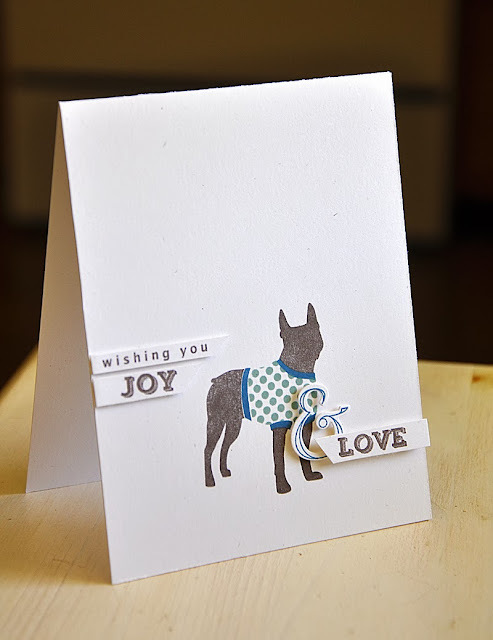 Hello and welcome to the fourth day of the Papertrey Ink October countdown and the first Design Team group post! Today's group post is all about showcasing the new Come All Ye Faithful collection of products. And what an adorable and fun concept for a Holiday collection this is! Erin Lincoln has everything covered and my mind is full of ideas. The mix and match capability of this set is definitely a stampers dream! First up, a simple card that I made with Christmas in mind, but honestly I think it might actually work for other occasions throughout the year too. I stamped the cute pup in smokey shadow and the sweater in ocean tides and enchanted evening. I can't wait to play around with this color combo some more on holiday projects. 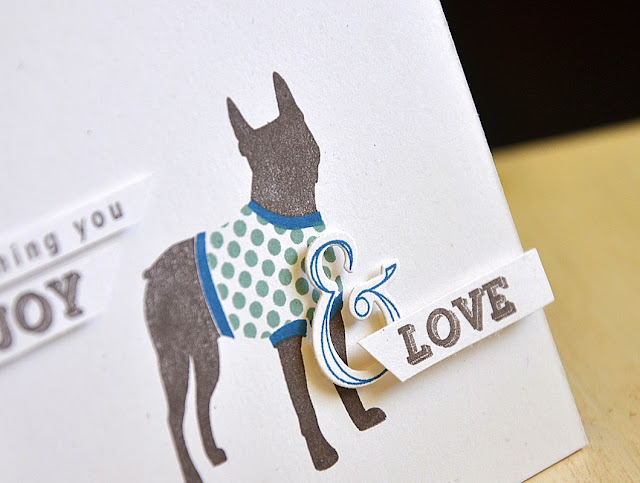 I pulled out my Grand Ampersand stamp set and die to create an ampersand to complete the sentiment. Placed it alongside a few sentiment strips which were trimmed at an angle. I just love one-layer cards for the holidays! Here's one for you that features the same pup from above. This time I stamped him in soft stone, ocean tides and limeade ice. I stamped the strand of lights coming from the pups mouth as well as off of the sentiment. I love the unexpected touch of the extra strand extending off the "Bright". 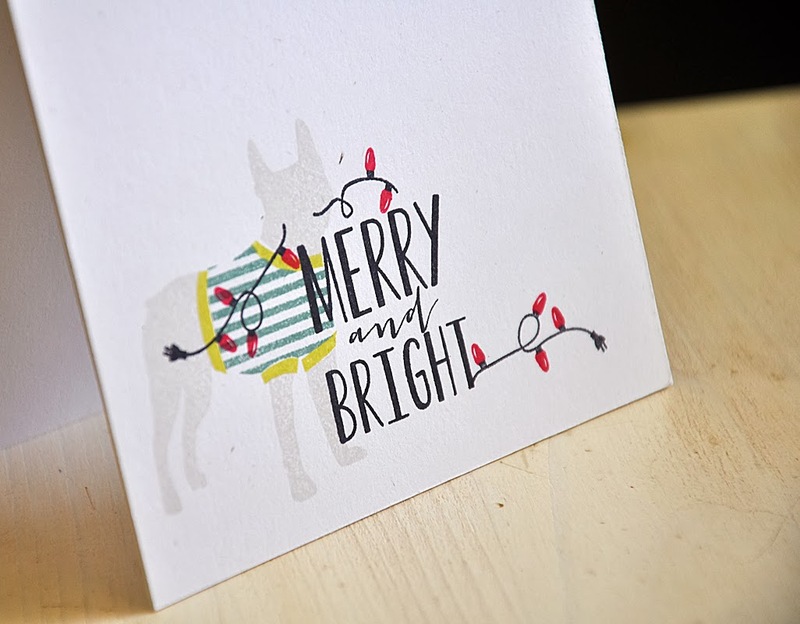 By the way, this cool sentiment is from the 'Tis the Season Sentiments set. The black with ocean tides, limeade ice and pure poppy is another fun holiday color combo I look forward to working with again soon. Well, that concludes my look at Come All Ye Faithful collection of products. Just remember... these stamp sets and coordinating dies will be available for purchase through Papertrey Ink, beginning October 15th. Great cards, Maile! 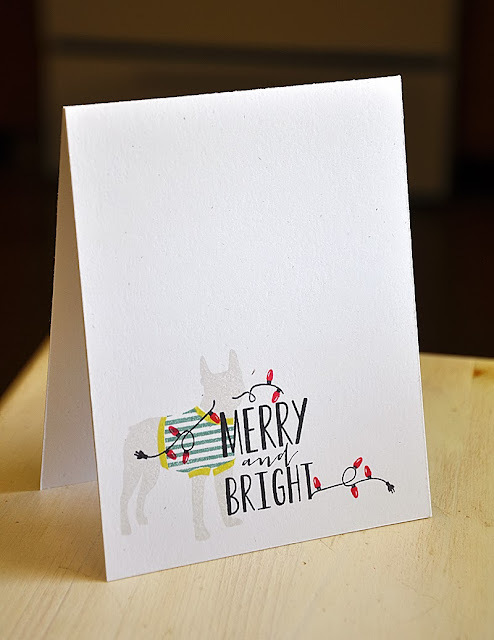 I especially love how you stamped the string of lights with your sentiment on the second card! Love these--especially the trick of the lights! I'm loving your 'Tis the Season sentiments - great set. Love the tree lights, so cute! Love your use of the ampersand - wonderful! I love the blue one, original! That pup with the strand of lights is so clever and fun.